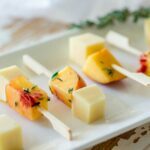 These Gouda and Peach skewers are a take on the 80’s party classic cheese and pineapple. Sweet fruit, savory cheese and all in small cubes that make it so easy to eat. Yes these fruit skewers are perfect for a party!!! And the fresh thyme gives these gouda and peach skewers something a little bit different. Something that will surprise and delight and something your guests will remember! Oh cheese and fruit is a great combination. Do you remember cheese and pineapple on sticks? I know for me it was a birthday party staple. And I loved it!!!!!!! I recreated it a couple of years back with my Rosemary Pineapple Mozzarella Skewers, you should check them out. They are totes gorgeous!!!! 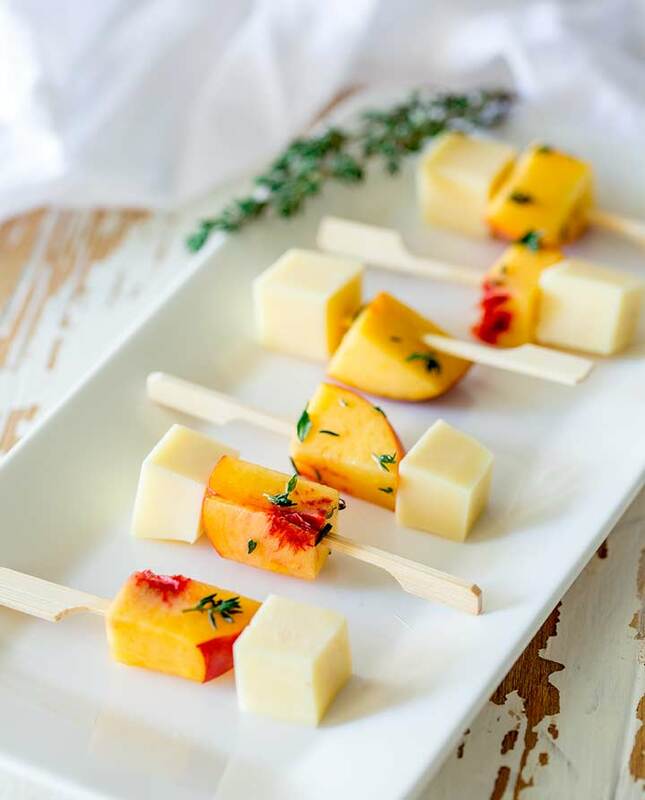 Just pretty and like these Gouda and Peach Skewers, perfect for a party! 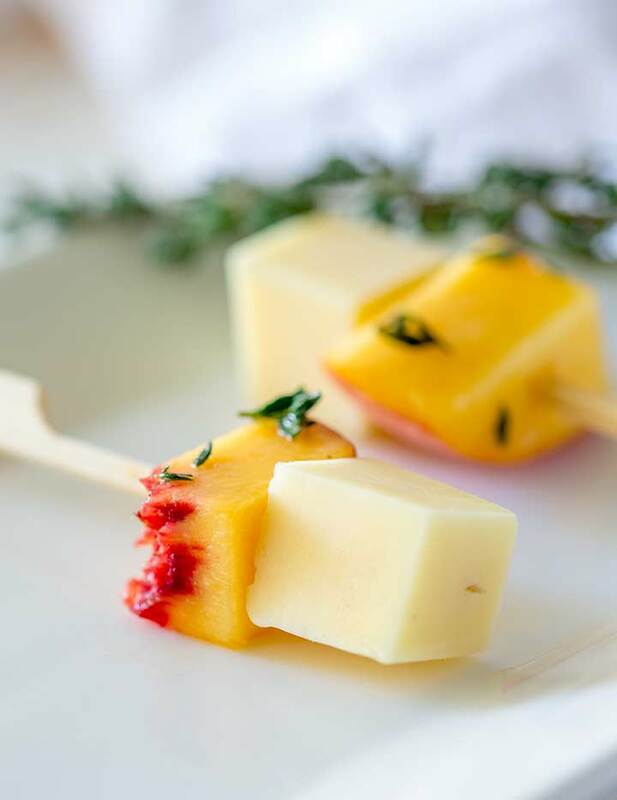 These are a massive hit at parties, the cheese and fruit combo is familiar enough to get people to try them and then the flavor has them coming back for more. Kids love them too. When I made this batch up to take photos of, I boxed up some skewers for a friend….they never made it to her. My kids got in the car after school, spied the skewers and that was the end of that! Extra Virgin Olive oil and herbs with fruit? I know it sounds odd but they really do work well together. These gouda and peach bites are more savory than sweet, so the herbs and evoo really help to tie the flavors together. Think of these as a bridge between you sweet party items, like my mini passionfruit cream pots, and your more savory items (like my Tandoori Chicken and Cucumber bites. I love using fresh thyme with fruits, it has a real floral note that makes the fruit taste sweeter. Which is perfect here as you want the fruit to be ripe, but not so ripe that it won’t hold together when it is pushed onto a skewer. Can you make these fruit skewers ahead of time? 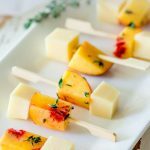 These gouda and peach skewers can be made several hours ahead and then kept in an airtight container. I would recommend no longer than 6 hours as the cheese starts to soak up some of the peach juice. Giving it an slightly softer texture. But six hours means you can make them in the afternoon and have them in the fridge ready for your party in the evening. Although as these are pretty stress free, I would use your afternoon to prepare something else and leave these until last. But to get yourself ahead of the game, have the cheese cubed ready and the peach cut up and mixed with the evoo and thyme. They will keep in the fridge all day like that. It is such a simple assembly job, you can drink a glass of wine and skewer these up in no time. 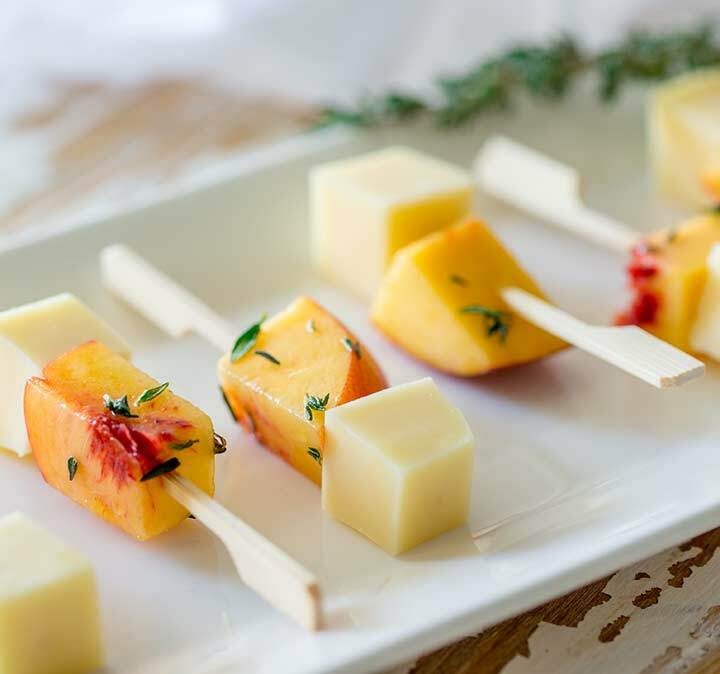 These Gouda and Peach skewers are a take on the 80's party classic cheese and pineapple. Sweet fruit, savory cheese and all in small cubes that make it so easy to eat. Yes these fruit skewers are perfect for a party!!! And the fresh thyme gives these gouda and peach skewers something a little bit different. Something that will surprise and delight and something your guests will remember! Cut the peach in half and carefully remove the stone. Place the peach in a bowl with the extra vigil olive oil and fresh thyme. Stir gently to coat the fruit. 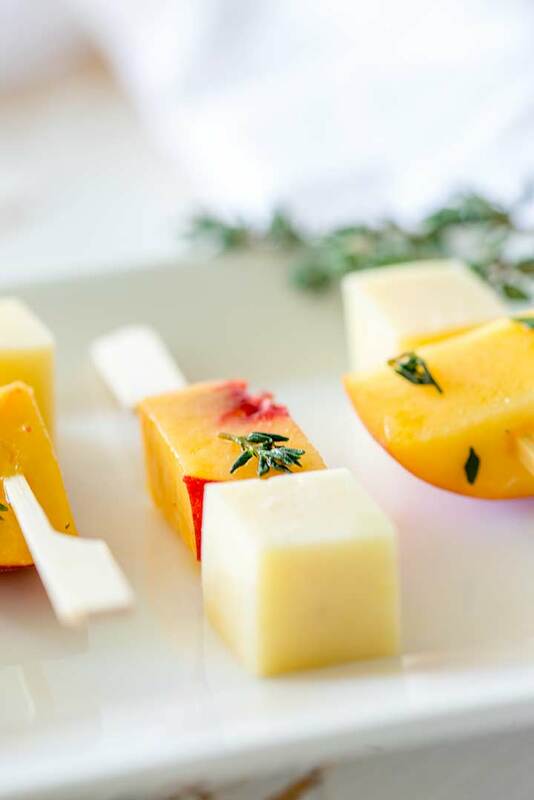 Thread a cube of fruit and then a cube of cheese onto each skewer and set on a tray. 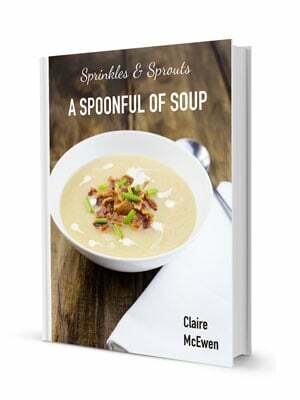 These can be served immediately or stored in an airtight container for up to 6 hours. If you love food why not subscribe to my newsletter, I will drop you an email every now and then, just to say hi and send you a couple of recipes I think you might love, like these Gouda and Peach Skewers. These are party perfect! I love fruit and I love cheese and I’m always amazed at how delicious they are together! Pretty too! What fun, delicious looking skewers! Totally a party-perfect appetizer for these sweet seasonal peaches! Love it so!!! The flavor of gouda is just right with the peach! Yum, a party hit. Can’t wait to give them ago as I love peaches and love thyme.